Funnel cloud rotating over the countryside to the east of Maghera during the evening of August 2nd 2008, I took this image through my open bedroom window using a Fujifilm bridge camera, I was actually on the computer reading the updated convective outlook regarding the potential for funnel clouds and tornadoes over N. Ireland when I turned around on my chair on an impulse and saw this through the window, talk about a shock and talk about timing. 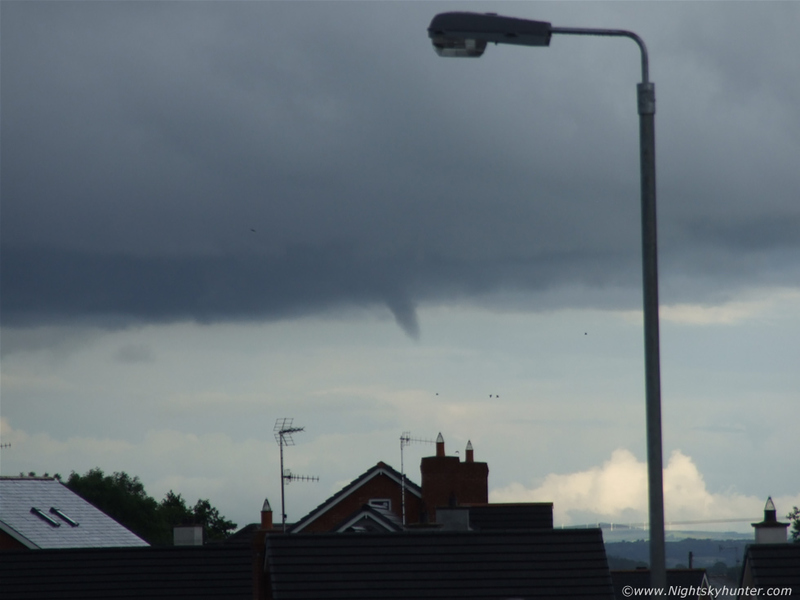 At its best the funnel was half way to the ground when I first saw it however by the time I got the camera zoomed and focused it had retreated a little, however still great to catch it in the act over the rooftops of the Glynns with distant white convection on view across Antrim on the horizon, read the report for more information. * All images are available for sale in the form of photo prints, canvas or digital files for licensing, if you are interested in a purchase simply drop me an email.